You can create individual departments in which you then can create shifts. Employees can be assigned to one or multiple departments. 1. Click on menu item 'departments'. 2. Click on '+ add department'. 3. Name the department, chose a colour and click 'create'. 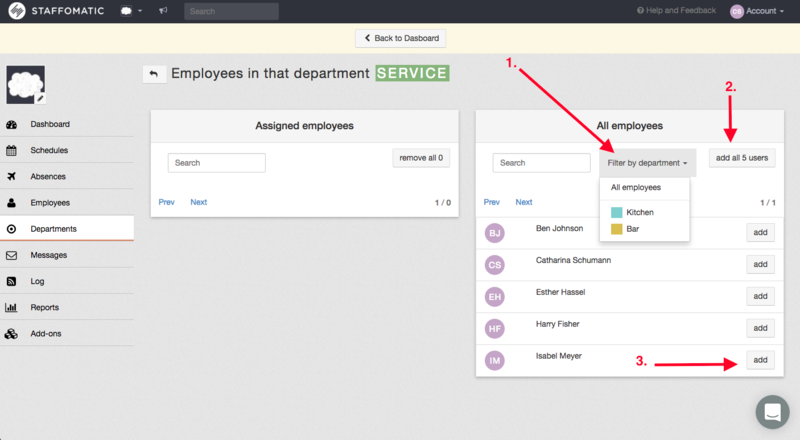 a filter allows you to select employees from different departments (see 1. ): when you chose a department you will only be shown employees assigned to it. That way you can easily transfer them into another section instead of adding them all individually.